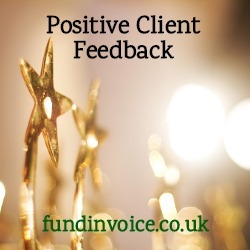 Nice piece of feedback received from the Managing Director of a care recruitment business that we found a select invoice finance facility for, some time ago. ". . . thanks for checking in. Again, your input has helped massively throughout this whole journey.". Great to get such positive feedback. You don't have to meet any minimum volume levels. You can terminate at any time, by just not using the service again. You can select some invoice for prepayments, but leave out others that you have not selected. You can use the funding to cover just peak cash flow requirements. The selective approach means that costs can be carefully controlled. Selective funding is a very flexible way to operate, and it still gives you all the cash flow benefits of receiving prepayments against unpaid debtor invoices. In the case of recruiters, such as this care staff agency, it means they can use the cash that is generated to meet costs, such as staff wages and payroll. This is the reason why so many recruiters use this kind of finance, we estimate that usage within the sector is 20 times higher than the national average. The alternative to selective facilities is what we term whole turnover, or a revolving line of credit / credit line style facility. With these facilities you submit all your invoices (this can be really easy e.g. via an automated sales ledger upload in some cases), and you therefore get the maximum level of funding against your whole sales ledger. An overall prepayment is initially released, created the maximum cash advance possible, and they as invoices are paid by customers, your indebtedness is repaid and any balance of invoices due to you will become available to draw down. As you raise new invoices, those transactions generate new available funds, that you can also draw down. In this way the credit you take is said to be "revolving" in nature. This is ideal if you want to maximise your funding levels.